July 8th, 2017 By: GGT Category: 2017/07 release, Figure News. STP (Skytube Premium) is going to release the Ping-Yi ( 瓶児 ) Jasper Ver. ( 碧玉ver.) 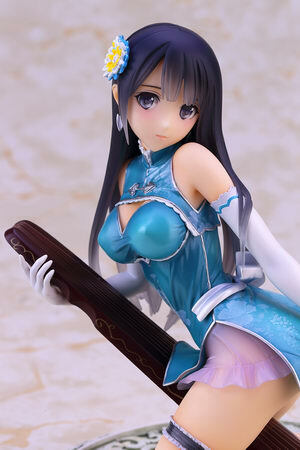 1/6 PVC figure from the “T2 ART GIRLS” ( Ｔ２アート☆ガールズ ) by Tony Taka. Pre-order will be taken at Wonder Festival 2017 [Summer] and STP online shop on July 30, 2017. Will be released in December 2017. Around 170mm tall, 15,500 yen (taxed in). Castoffable. 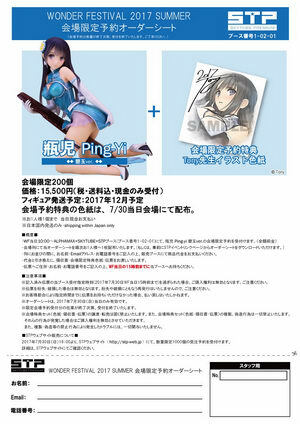 Only 200 pieces will be available at Wonder Festival 2017 [Summer], 1,000 pieces will be available at STP online shop. Wonder Festival 2017 [Summer] and STP online shop exclusive. Wow we have 8 exclusive figure news for this weekend! For those of you who want to get this Ping-Yi Jasper Ver., you can pre-order her at WF2017[summer] or STP Online Shop on July 30, 2017 with your proxy service. The booth number of Alphamax + Skytube + STP at Wonder Festival 2017 [Summer] is 1-02-01, you will find them there.